Although many of us view guitars as works of art, few of us know anything about the creation process. Great playability, sonic characteristics, aesthetic beauty, and price are just some of the factors that guitar luthiers have to consider when creating their masterpieces. From raw wood to completion, the nuances and attention to detail that go into the final product are mind-boggling. I’m just glad I’m on the playing end of this arrangement! Taylor Guitars is an American guitar company based in El Cajon, CA. Started in 1976 by Bob Taylor and Kurt Listug, the company has become one of the most successful acoustic guitar manufacturers in the world, rivaling Martin and Gibson. Today, Taylor production ranges from mid-level acoustics to professional quality six strings, and has even expanded to electric solid, hollow, and semi-hollow body guitars. Some of their endorsers include Leo Kottke, Dave Matthews, Jason Mraz, Taylor Swift, Zac Brown, and Peter Sprague, and Taylor guitars have become the gold standard in modern country, folk, and bluegrass music. 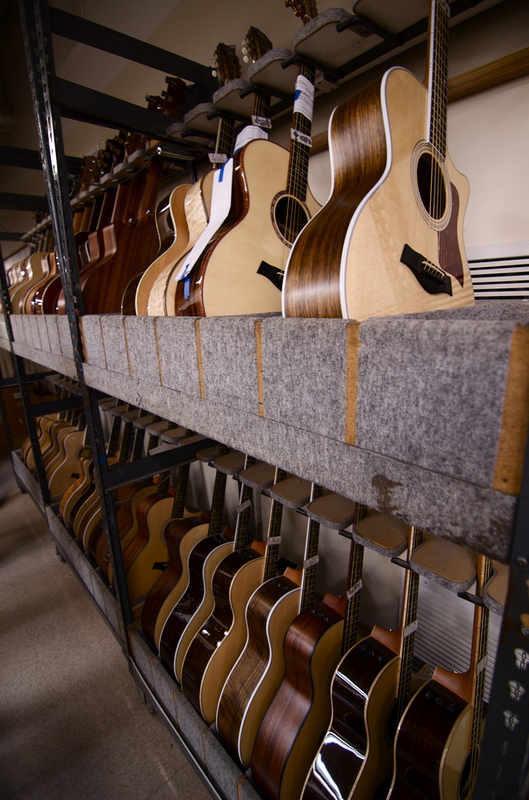 One of the coolest things about Taylor Guitars is their free, daily tours of their factory. Located in El Cajon, an inner region of San Diego County, these tours cover the entire process of the acoustic sector of production. 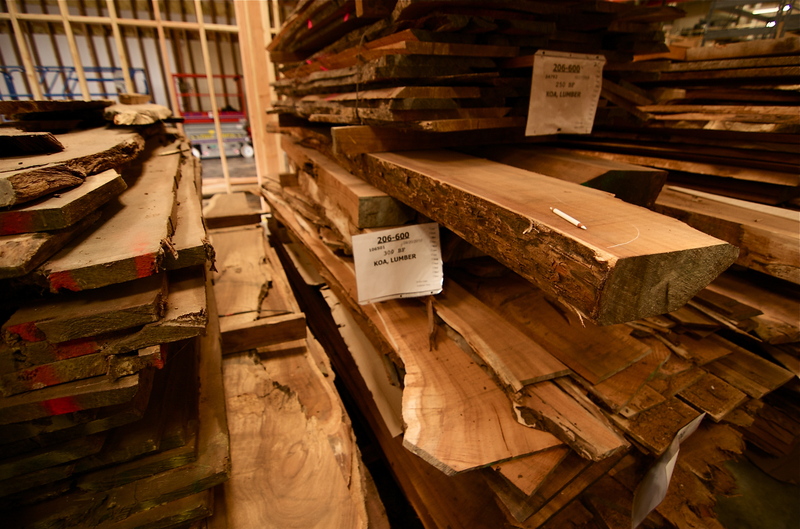 You start by viewing their extensive lumber collection, consisting of exotic woods like Hawaiian koa, Indian rosewood, big leaf maple and tropical mahogany. Then, you view the shaping process, a mixture of machine and man effort to craft necks and bodies from slabs of wood. 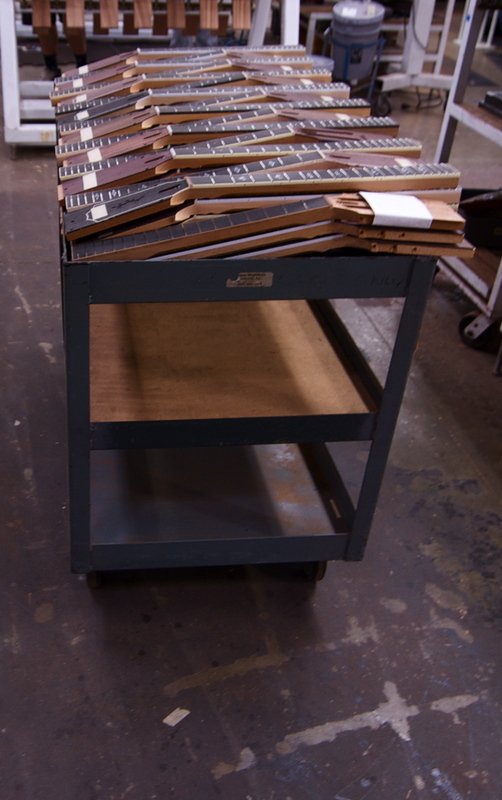 There is a specific neck area, where fretting and sanding occur, and a specific room for inlay work on headstocks, necks and sound holes. 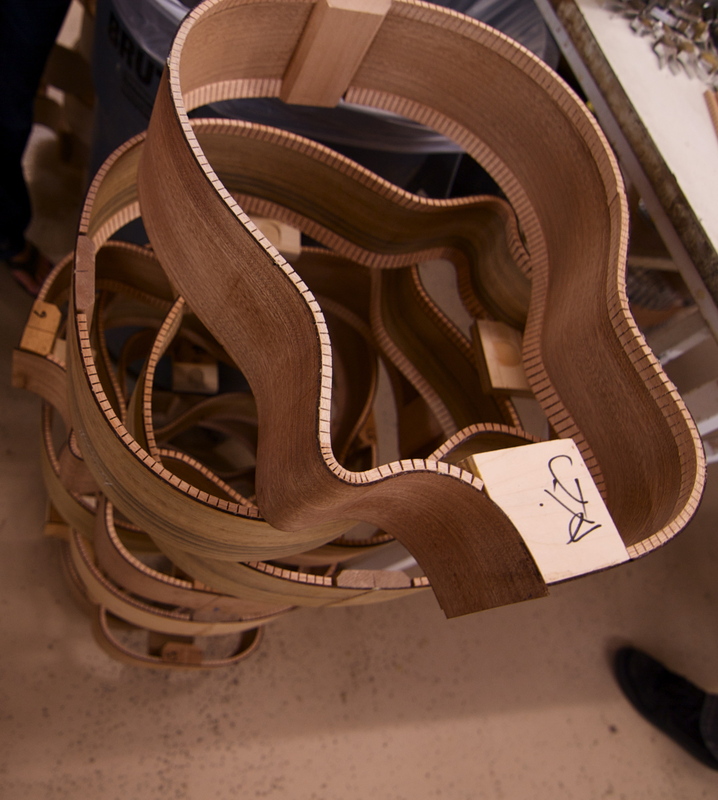 You also get to see the wood bending process that creates the sides of body, and the binding station, where the body parts are attached. And of course, you get to the see the finish room, where different wood stains and varnishes are applied, followed by a final set up station. 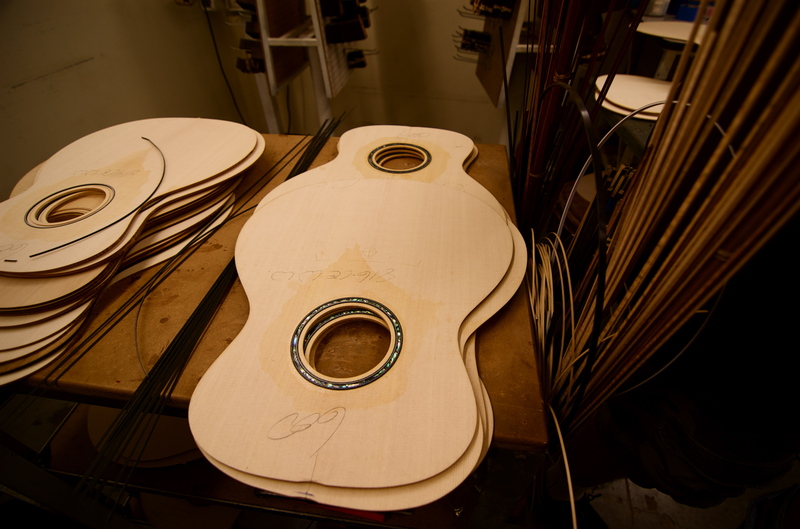 Ultimately, you get to see the entire process of creating an acoustic Taylor guitar. Plus, the tour ends right where it started – in the TaylorWare store and showroom, stocked with the entire array of Taylor products, ready for immediate noodling. Probably the most different, progressive, and desirable aspect of Taylor guitars is their patented bolt-on neck technology. To put it simply, most acoustic guitar manufacturers use a strong glue adhesive to attach necks to guitar bodies. Over time, due to string tension, climate, and sound vibrations, the angle at which this neck was glued becomes warped, altering the intonation and action. Because the neck is strongly glued, the only way to fix this problem is to take it to a professional and get a “neck reset,” a very expensive repair. Aside from this inconvenience, glued necks run a high risk of snapping, and give the player little freedom in altering the playability of their guitar. Taylor solved these issues with their bolt-on neck technology. Instead of gluing their necks, they use a specialized neck joint and bolt system to attach necks and bodies. This system uses special spacers to establish the perfect neck angle. Over time, when the neck angle becomes warped, the repair procedure is greatly simplified – you just need to unscrew the neck bolt and insert bigger spacers. Furthermore, if the player ever wants to change the neck angle or replace the neck altogether, it’s as simple as unscrewing the bolts and making the change. A very practical and innovative solution to an age-old problem. Lastly, although hugely successful, Taylor is still run like a small business. Bob Taylor is almost always present at the factory, and the faculty are very friendly and knowledgeable. Taylor is also greatly concerned with sustainability and environmental protection. In a business that often misuses lumber and disregards the scarcity of resources, Taylor has stepped up with the creation of non-profit organizations supporting responsible foresting, and have pledged to use responsible business and manufacturing practices. Right on! 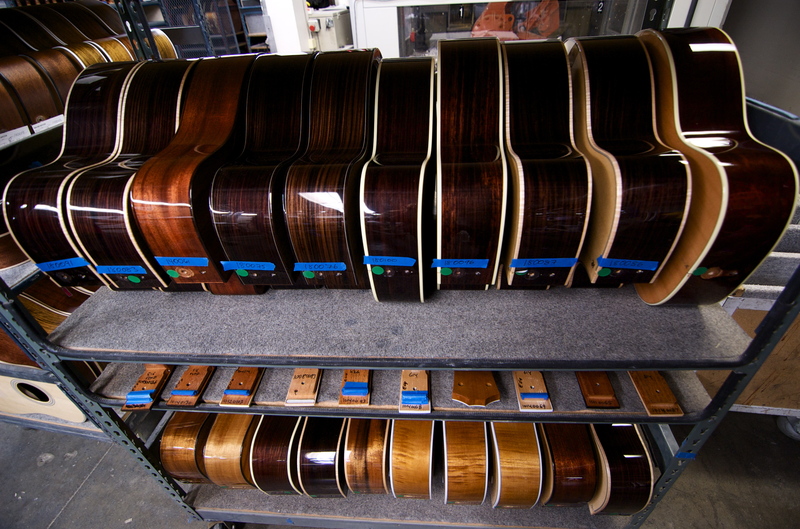 So if you’re in San Diego be sure to check out the Taylor Guitar Factory @ 1980 Gillespie Way El Cajon, CA. For more info on tours, check the the Taylor Factory Tour website and for more on Taylor Guitars, their products, and sustainability, check out the Taylor Guitar Website.